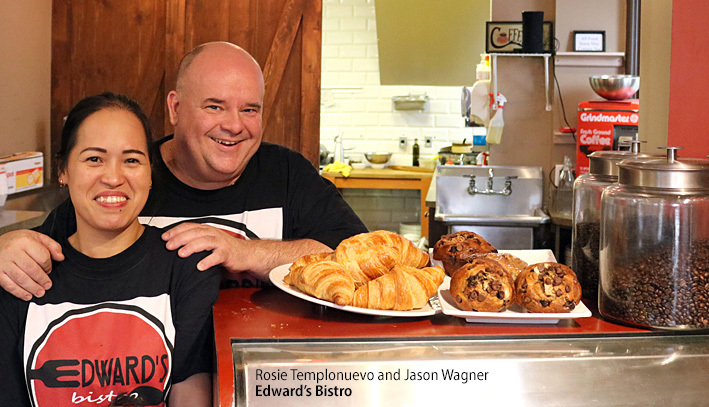 Edward’s Bistro has opened its doors at 35 Second Street East offering a varied menu of tasty meals, great coffee and delicious sweets with a focus on fresh, local ingredients. The eatery is the brainchild of new residents Jason Wagner and Rosie Templonuevo, who recently resettled to Cornwall with their son Edward – the inspiration behind the restaurant’s name. The couple explored a few communities before settling on Cornwall after spending a day driving around the community and exploring the Downtown area. The beautiful space for their new venture left little need to be convinced. Edward’s Bistro represents the latest chapter in a long-term love affair of food and fine cooking for Jason, a trained chef with over 25 years of professional experience. Together, he and wife Rosie have put together an eclectic menu of favourites that they’ve perfected over the years from many styles of cuisine. A key mission of the restaurant is to avoid pre-packaged foods wherever possible with a preference instead on fresh, local ingredients. Breakfast and brunch items are created with Laliberte eggs from nearby St-Isidore, as an example. “We want to do as much scratch cooking as possible, with a focus on healthy and wholesome food,” he added. Coffee is also a highlight at the bistro. As for the menu, there are no shortage of options to satisfy all taste buds. The current menu features a variety of brunch and lunch options, with dinners to be introduced in the near future on Thursday to Sunday evenings. Visitors can feast on anything from pancakes and Eggs Benedict to more diverse selections like Quinoa paëlla with shrimp, sausages and eggs, chicken breast cordon bleu, and fillet of salmon. There’s also staples like thin crust pizza, burgers, poutine and a variety of salads and sandwiches.